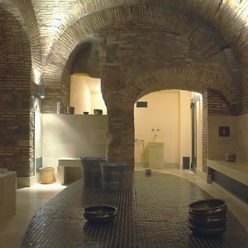 Thanks to the partnership with AcquaMadre Hammam, one of the most ancient and fascinating hammam in Rome, located few steps from Palazzo Baj, you will enjoy or give an Hammam path, a facial and body SPA treatment, a wellness path or a massage for a total relax experience. An exclusive discount is reserved to Palazzo Baj guests. Inside the Hammam you find multiple rooms; in each one, from the coldest to the hottest, there are attendants taking care of your every need. You begin in the changing room (apodyterium), then you proceed to the warm bath (tepidarium 36°) where, after a hot shower, you start the hammam: relaxing on a warm marble bench with a hot water wash and the use of natural black olive soap, than from the tepidarium, you move the hot baths (calidarium 45°- 100% humidity) where you will experience the real “steam bath” where a vigorous body scrub is made by spa attendants, with the traditional Hammam glove. 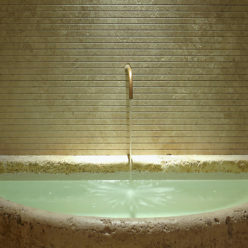 Finalizing with cold bath (frigidarium 28°) which acts as a skin and muscle toner, the hammam ends in the relax room where you can enjoy special herbal tea. All treatments require bathing suits.